Welcome to The Lyndsay Guesthouse - Skegness. Price guide. 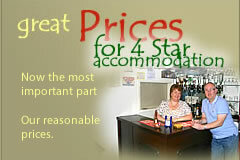 £32.50 per person per night Bed and Full Breakfast (two people sharing). £45 per night single person in a Double room (We have no single rooms). We take debit and credit cards, Paypal, or cash. We require a £40 deposit per break and it is non refundable. From time to time we will be offering exciting late availability and special occasion offers - please check us often for these. Reductions for out of season stay. CHECK IN BETWEEN 2PM AND 7PM UNLESS OTHERWISE ARRANGED. We do one night stays please telephone for availability.